Edwin Ray Guthrie was born in February of 1855 in McLean County, Illinois. Hattie was also born in Illinois on 11 April 1856. Her parents were Thomas Johnson & Elizabeth Jane (Smith) Pickett. PICKETT HOUSEHOLD: Thos J 39 Editor "R.I. Register" 1000 3000 KY; Elizabeth J 26 wife N Yk; Charles 12 Ill; Thos J Jr 9 Ill; Milibeth 7 Ill; Harriet 4 Ill; May 3 Ill; Margaret Kelly 24 hired girl (domestic) Ireland. While living at Rock Island in his role as editor of the Rock Island Register, Hattie's father, Thomas J. Pickett, was one of the earliest supporters of Abraham Lincoln's candidacy for President of the United States. See 'Abraham Lincoln and Friends' for more about Thomas J. Pickett. Excerpt from 'Abraham Lincoln, A Biography': "Three months later, when Thomas J. Pickett, editor of the Rock Island Register, proposed to come out publicly for him, Lincoln begged him not to do it." GUTHRIE HOUSEHOLD: Robert E. 60 Farmer OH PA PA; Lucy 54 wife keeping house MD ENG ENG; Edwin R. 25 son works on farm IL; Mary B 18 dau @ home IL; Lucy M. 20 dau teacher IL; Fred L 15 son @ home IL; Ada 13 dau IL; Maggie 10 dau IL. This marriage probably took place in Illinois. Edwin Ray Guthrie Jr was born on 9 January 1886 in Lincoln, Lancaster, Nebraska, the eldest of 5 children. He married Helen Mary MacDonald in 1920. Edwin was a school teacher who became a trailblazer in the field of behavioral psychology. During WWII he served as a chief (civilian) consultant to the overseas branch of the general staff in 1941, and as chief psychologist of the overseas branch of the Office of War Information in 1942. In 1945 he was elected as President of the American Psychological Association, which later awarded him a Gold Medal for outstanding lifetime contribution to psychology. A biography written by his son, DNA Project participant, Peter MacDonald Prenzel-Guthrie is found in 'Portraits of Pioneers in Psychology'. The University of Washington at Seattle, where Guthrie attained status as professor emeritus after a long career as an educator, honored him by naming the campus building which houses the Department of Psychology after him: Guthrie Hall. Edwin Ray Guthrie died on 23 April 1959 in Seattle, Washington. His wife Helen survived him by twenty years, passing on 17 April 1979. Named for his paternal grandfather, Robert Elton Guthrie was born on 8 August 1887 in Lincoln, Lancaster, Nebraska. He was living with his parents during the 1900 census, but was not listed with the family in 1910. Robert studied Mechanical Engineering at University of Nebraska in the Class of Nineteen Eight (1908). 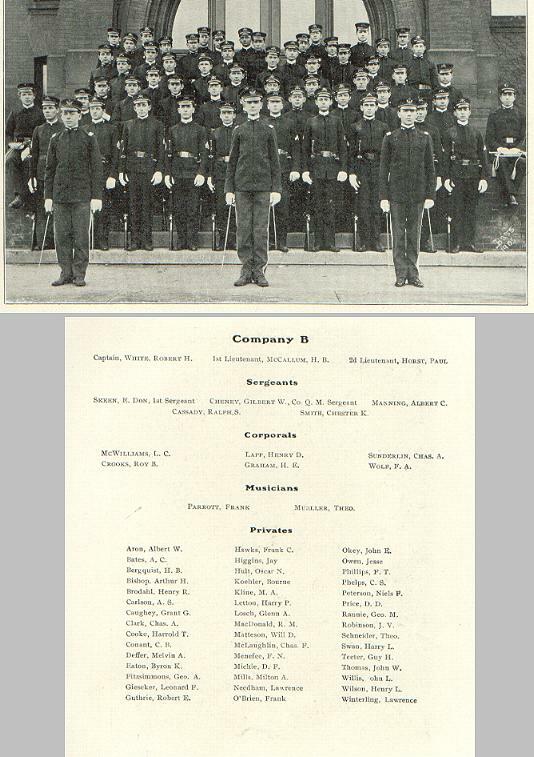 The Cornhusker Yearbook lists him as cadet holding the ranks of First Sergeant and Captain in Company B at the university, and achieving a Gold Medal in the Individual Drill and Pershing Rifle Gold Medal. He was also a member of the Engineering Society. The US Army Register indicates he was in a permanent service position as a 2nd Lieutenant coast art. corps on 7 Apr 1909. He achieved his rank as a First Lieutenant in Nebraska on 11 Mar 1911 at the age of 23. He was at Camp Jackson, Richland, South Carolina in 1920 where he is listed as a Lieut. Colonel. Two years later, on 11 Nov 1922 he married Florence Ladd Bowen (1898-1992) in Springfield, Massachussets. They became parents to a son, Robert Elton Guthrie, who is a participant in the Guthrie DNA Project, and two daughters, Virginia and Mary Alice. He retired from the US Army in 1946 to Santa Barbara, California after serving in both World Wars, and lived there until his death on 31 Oct 1960. Louise was born in April of 1889 in Lincoln, Lancaster, Nebraska. She was enumerated with the family in 1900 and 1910. She worked for the University of Nebraska as a laboratory assistant. She is listed along with her brother, Richard T. Guthrie, in the 1912 university yearbook. "LOUISE GUTHRIE, Lincoln, Neb. Kappa Alpha Theta, Household Arts Club, Agriculture." No further information. Richard Terrell Guthrie was named after Hattie's brother-in-law, Richard Terrell. Richard was born on 26 Oct 1890 in Lincoln, Lancaster, Nebraska. He attended the University of Nebraska and was pictured in the 1912 yearbook along with his sister Louise. "RICHARD T. GUTHRIE, Lincoln, Neb. Innocents, Forest Club, Kosmet Club, Chairman Junior Hop Committee, Individual Drill '11, Captain Co. B, Captain Pershing Rifles, President Senior Class, Editor Forest Club Annual, Agriculture." He was working as a Forest Examiner for the US Government in 1917 in Denver, Colorado when he completed his WWI Draft Registration Card. In 1920 & 1930, he was living in Norman, Cleveland, Oklahoma and was listed as a Captain in the US Army. Richard died in San Francisco, California on 18 November 1859. No known children. Mary Evelyn Guthrie was born in August of 1897 in Lincoln, Nebraska. She remained single and was employed as a public school teacher in 1930 when she was enumerated with her widowed father. She died in 1987 at age 90 and is buried at Ashland Cemetery in Ashland, Saunders, Nebraska in Plot: Sect Old, Blk 14, Lot 37. GUTHRIE HOUSEHOLD: Edwin R head 55 mx1 25 IL OH WV merchant @ Bigelow Piano; Hattie L wife 54 mx1 25 5ch, 5liv IL KY NY; Edwin R 24 NB teacher public school; Richard T 19 NB; Louise 21 single NB IL IL laboratory asst state univ; Mary E 12 NB. GUTHRIE HOUSEHOLD: Edwin R head 64 IL OH MD merchant; Hariett wie 63 IL KY NY; Mary E. daughter 22 NB IL IL Teacher High School; Bernice O'Kief lodger 33 NB Wisc IA Teacher Public School. Hattie died in 1921 and is buried at Plot: Sect Old, Blk 14, Lot 37, Ashland Cemetery in Ashland, Saunders, Nebraska. GUTHRIE HOUSEHOLD: Edwin R head 75 wd m@29 IL OH MD; Mary E. dau 32 single NB IL IL Teacher Public School. Edwin died in 1935 and is buried at Ashland Cemetery. Sect Old, Blk 14, Lot 37 in Ashland, Saunders, Nebraska.